Light-Weight – 4 Cycle Stomper Rental – Stone XH670, available for rent from the Duke Company in Rochester NY, Ithaca NY and the entire Western New York region. The light 4-cycle Rammer / Stomper offers ideal impact from a lightweight package that is designed for cable, pipe and utility trenches. 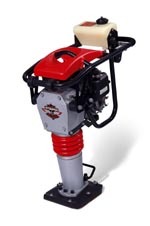 4-cycle, 3 hp Honda engine designed for rammer applications. Quality components including 2-stage air filtration system, forged pistons and solid snubbers.